Monday, November 15, 1982—broke trail to cabin, then back to Blue Lake and pulled sleds to cabin. Cut a trail to cabin and broke a trail to woodlot. Had a nice evening at cabin, a very nice day. Tuesday, November 16, 1982—up before dawn, went to woodlot and brought in five loads. Cleaned up cabin, loaded sled and headed out. Saw lots of wolf tracks, mink fox and marten tracks, some moose and caribou tracks. Got home early in the evening. Tuesday, November 23 1982—very warm, light snow in the evening, 23° to 10°. Made fox, lynx, and marten sets. Must’ve been a whole family of lynx near here. Ski-Doo runs badly, Chris and Lloyd flew in for coffee, glad to see them. Saturday, November 27, 1982—sun shines, 10° to -10°. I feel sick today. Had a good trip out here, Ski-Doo ran fine. Very beautiful here at the trap cabin, nothing in the traps. Pack of wolves hunted past the cabin. Cut up stove wood. Almost a full moon tonight. Sunday, November 28, 1982—ice fog and 15° to 10°. Sore back. Ran some trapline, nothing. Put out two snares and one Marten set. Broke trail in woodlot. Cut up wood and ricked it. Put up fleshing beam in cabin. Beautiful moon tonight. Monday, November 29, 1982—made wolf, marten, and fox sets today. Reached road early and visited Darrel a few minutes. Saw seven caribou along the road. Ran line here, nothing. Called Beverly. 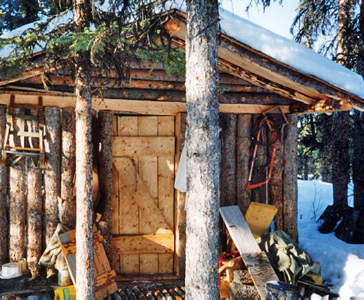 This entry was posted in Journal Entry and tagged Blue Lake, Indian style camping, pack of wolves, putting up wood, ran trapline, Siwash camping. Bookmark the permalink.